There is no doubt that humor can hook readers. Many of my elementary readers are attracted to books with characters who say funny things or that have plot lines that are ridiculous. Sometimes I don't quite get the humor in the books my students enjoy. But if they like them and it gets them reading then I'm all for it! When looking for something new to read, sometimes I just want a book that I can read without thinking too much. My shelves have several humorous memoirs that fit this bill. Similarly, sometimes students just need a book that gives them a good laugh. The two books I read this week definitely will be good additions to my student library because they will make kids chuckle. A title with the word "misadventure" in it is a hint that a book will be a humorous one. The characters in this book do have an adventure that will make readers laugh, but the word play also contributes to the humor within this story. Speed Bump is a bird with very tiny wings who can't fly very fast and feels inferior to his brother Early Bird. Early Bird always gets the worm and is admired by all the other birds. Speed Bump would love to be the one to get that delicious (or so he imagines) worm. There are black and white illustrations on every page of this text and dialogue bubbles throughout that tell part of the story. This book is funny, but it also contains important lessons about friendship, loyalty, and bravery. This is the first in a series that I think will be engaging for elementary readers. This is the fourth book in the Timmy Failure series, but the first that I have ever read. I can't say how this one compares to the earlier books in the series, but there is lots of humor and absurdity that will engage readers. In this book, Timmy Failure is on spring break and traveling to Chicago while he uses his detective skills to solve a case of stolen money. The adventurous antics of Timmy, his schoolmate, Molly, and his polar bear, Total, will amuse readers. The twist at the end also brings some humor to the story. While much of the plot is ridiculous, Timmy is facing challenges of childhood to which students may relate. Timmy's parents are divorced and his apprehension about his mother's relationship with her boyfriend becomes apparent. The ending of the book is just sweet, too. 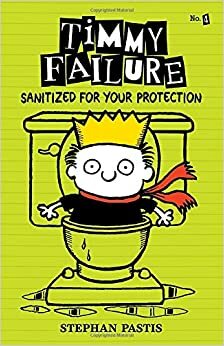 I want to read some of the other Timmy Failure books after reading this one and I'm sure some of my students will want to as well. I agree that students love humor. I'll have to look for those two books for my collection. Come see my week here. Happy reading! 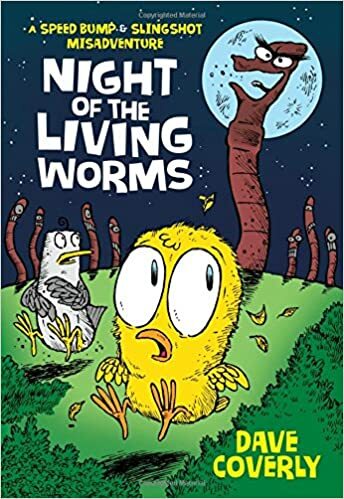 Night of the Living Worms sounds like a book a lot of my students would like. I will have to look for it. I bought the hardcover version, but just noticed today that there is a paperback copy at our Scholastic Book Fair. I hope some of the students pick it up. I love the look of both these books - they seem perfect for reluctant readers. These books will definitely be great for reluctant readers. There are lots of visuals that will appeal to them. Night of The Living Worms sounds hilarious. I still haven't read any Timmy Failure books either, but know there is one at the bookstore where I work, will certainly read it now. Thanks, Lisa. I really enjoyed Timmy Failure. It's funny and ridiculous, but charming, too.